Are you a creative? Do you run your own little business? Are you looking for somewhere amazing and fun to set-up up camp? Well you’re in luck! Lightspace has an upcoming vacancy in the studios and we’re looking for someone to fill the gap. It’s a super fun place to work. $155pw gives you a generous deskspace, 24 hour secure access to all the amazing facilities of the studios and includes all utility bills except telephone. The studios themselves are hewn from a renovated warehouse and feature polished wooden floorboards, high ceilings and shipping containers for the meeting rooms, bathrooms and kitchen. It’s a minimum 3 month lease. There’s a great comraderie amongst the tenants and loads of interesting events happening downstairs in the venue. So what are you waiting for? Wow, what a great night! Â With different light installations from local artists dotted around the venue the Ten10 Exhibition certainly brought something different to Brisbane. Â Great to see this stuff happening, especially produced by some local lads and ladettes. Some very good looking girls were recently onsite at Lightspace for the Australian Institute of Creative Design graduate fashion parade… and then the models arrived. Â All in all it was a fun night with some live music, fashion and DJs. Â Congrats to the organising committee, who were very skilful not only with clothes, but with moving furniture and helping with ladders. TEN10 is an audiovisual exhibition designed to showcase the natural relationship found between sound and image. It pairs ten visual artists (filmmakers, animators, motion designers, and video artists) with ten musicians from Brisbane to create new work. Resulting in ten short film pieces that are creatively open and individual in approach. 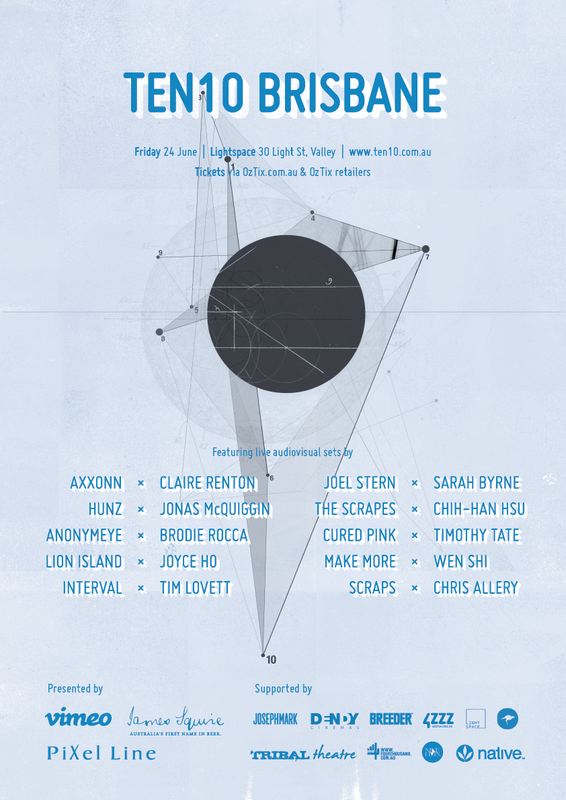 At Lightspace Friday 24th June. 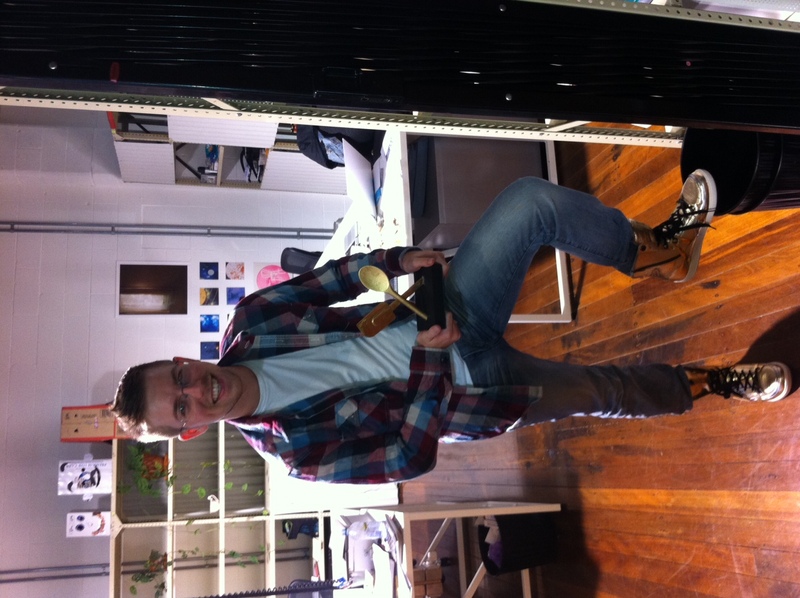 We are proud to announce Dale ‘Goldenboots’ Napier has won the inaugural Lightspace Studios Bake-Off for Australia’s Biggest Morning Tea. Â Dale, shown below with his trophy, dazzled all with his Snoreo-Stuffed-Choc-Chip-Cookie Pies. Â Those that survived the resulting heart attack were pleased to vote him the undisputed winner. Â Congrats Dale, and keep those cookies coming! Raleigh Paper’s annual Mohawk Roadshow is a rare opportunity to put graphic design in the spotlight. Â With some beautiful design and printing on display, the creative folk of Brisbane were buzzing with excitement. Â A big thanks to Sora from Raleigh Paper for putting the show on the road.